I purchased the original 1963 edition of this book on Amazon but I believe it is available in town at the ABDNHA Store. It was a bit crumbly and yellowed but a great book. If you enjoy reading about the history of ABDSP then you should get this book. 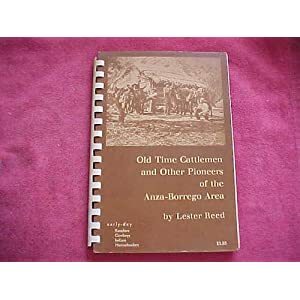 The book is basically a reflection of events and people from Lester Reed as he remembers them while pioneering the cattle drives in and around the desert areas. There are some great historical facts about how certain places were named and changed over time. For example, Collins Valley was for many years known as Joel Reed Valley until the name was lost to a family by the name of Collins. Monkey Hill was named by a Warner Ranch cowboy because it reminded him of a similar hill on the Warner Ranch. Lester Reed knew many of the old time pioneers with familiar names such as the Clark brothers, John McCain, Baily and more. He recounts many adventures and stories of cattle drives thru the desert and also how the families of the desert evolved over time. The book has many photos of the pioneers and personal annotations by the author. This is a short but very fun book to read, I recommend it to all who are interested in the history of ABDSP. If you think going for a hike in ABDSP is tough, read this book and try to imagine how early pioneers covered 10 miles a day in wagons trying to find water and food for themselves, horses and cattle while trying to traverse hundreds of miles in harsh desert terrain.